I specialize in children’s entertainment. One of the things that sets me apart from almost all other full time professionals, is that I am exclusively a children’s entertainer. Many other so called “children’s entertainer” are only doing it to fill in the gaps, between the higher paying adult gigs. More than 25 years ago, I did the same as everyone else, but then I began to discover that I loved the amazement and wonder that I see in the children when I perform, and I decided that I was going to dedicate myself to being the very best children’s entertainer I could be! Do you perform for adults? In your shows, do you do more than just the magic? I can do balloon animals, when that is what is booked. I never do balloon animals at preschools or hospital environments. 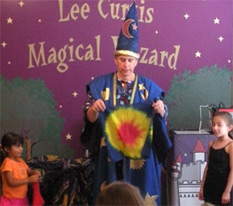 I perform anywhere children and families are present. Birthdays, schools, preschools, school age daycares, scouts, fairs, libraries, picnics and even weddings where you want me to entertain the kids while adults are involved in other activities. That is just to name a few, there are of course other places children and families gather, that my shows offer a lot of entertaiment. The quickest way to reach me is call my 800 phone number. I do have a local number, but since I have moved more than a few times in the last 20 years since getting an 800 number, the same number has followed me everywhere. Plus when I am not in my office, the 800 number follows me to my cell. You can also reach me by email, however I never book shows through email, I always require a phone call to do it. That way I am sure, a 7 year old is not booking me for his birthday party without Mom and Dad knowing. I never want that to happen, again! How long does your act last? Preschools shows are 30-35 minutes. School age daycares are 45-50 minutes. School assemblies are 45-50 minutes. Birthday parties are from 35-60 minutes, depending on the package you want. See Birthday Party Packages for more info. This is a very controversial subject, in the world of children’s entertainment. My answer is NO! I actually used to, I used to perform with rabbits and doves. But not any longer. It was a tough decision, and one that some of my associates get very hostile toward me when I share my stories, experiences and observations. Like others, I took good care of my animals. Some of them were treated as household pets. I never “stuffed” my animals into tight secret compartments to produce or vanish, they were kept comfortable. They were loved, and some of them seemed to actually love the interaction with the kids at the shows, Crystal the Magic Bunny was the greatest, she performed with me for 8 years (a long time for small rabbits). She really did enjoy performing, she was actually quite the ham! Those are the positives. No matter how well bunnies are cared for, you have to transport them from home to the show. Rabbits can survive in a variety of environments, they can live in the desert, or in the snow. However they are more susceptible to drastic changes in temperatures, more susceptible to the drastic changes than us humans. Think what happens when we go into, and out of air conditioning and the hot summer day outside. Or the opposite, snowy day outside and warm toasty day inside. What happens, when we do this several times a day? Our immune system is affected and we are susceptible to summer and winter colds. So when the magician takes the bunny from home, on a warm summer day, puts him in an air conditioned car to drive to the show, takes him out of the air conditioned car into the warm summer day weather, while he carries him into the cool air conditioned house for the party. Now repeat all that when the magician is done. 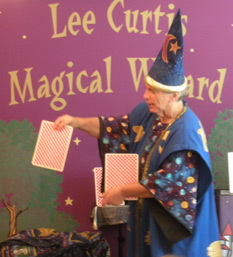 Now multiply that if the magician has more than one show on a Saturday. Rabbits and birds have some natural enemies, and they can smell that a dog or cat has been in a room, even several days ago, and it makes them very skittish and afraid, that makes them very defensive, and more prone to scratch and bite. In order to keep rabbits and birds from having a “bathroom” accident in your house, the magician must keep the animals away from food and water several hours before the show, some magicians don’t even think that is a problem. If he has several shows in a single day, they must be deprived way too long. Though I never allowed kids at a party to pet or touch any of my animals, many magicians do allow it, because if you don’t, the kids are disappointed, they expect to be able to. If a magician is doing several hundred shows a year, multiply that by the number of kids that see the show, and get to touch the bunny. It is going to HAPPEN, it can’t NOT happen. It is just a matter of time. Sooner or later, the rabbit is going to bite a child. So there is a liability issue, not only is the magician liable but the party hostess is going to be legally liable also. So there you have it, my reasons for not having animals in my show, I know some parents still will want it, so I guess I am not the one they would want to hire. 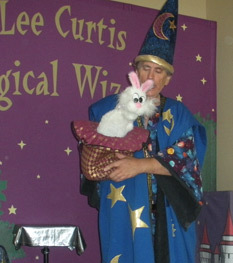 I do love using puppets in some of my shows, the kids relate very well to them. The puppets end up doing magic themselves. Many times children ask me before or during the show, if I am going to make birds or a bunny appear. But I have NEVER had a child show disappointment after the show that I did not make animals appear, because it really was not necessary to entertain them. What is the cost of your show? It varies, please call me to discuss show prices, it can differ because of the driving time, length of show, and how much and how big of equipment I need to bring depending on the venue. By phone only. I do not ever book shows through email. Two reasons, first; I want to know I am talking to a parent, and not a 10 year old booking me for his birthday party. 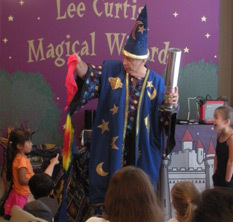 More than once, Mom and Dad were so surprised and horrified when I showed up to do a magic show at a party. Jr. had seen me at another party, and wanted me for his party, but knew Mom and Dad would not go for the expense, so he booked me himself. Second reason; there are a number of different scams targeting entertainers thru email, even though I recognize the scam for what it is (first clue, they want me for a local show, but provide me with a foreign email address or even a foreign phone number, LOL) I won’t play. You can email me with your questions, but when it comes time to actually reserve and book me, it must be a phone call, 1-800-436-8749. After you make your reservation, I will mail you a confirmation letter. Sometimes, but not very often, I can be booked for a show the same day. However for Birthday packages I recommend that you call a month in advance, to have good chance at having your first choice for party time and date. School assemblies usually also a month in advance. Preschools and school-age childcare for shows during the summer, they would do well to make reservations several months in advance, as well as other school holidays like spring break. How long have you been performing magic? In late 2009, life took an interesting turn, after living and working in Northern California all my life, we moved to beautiful and picturesque Colorado, so now the fun begins to build a new following and new business. Comical. 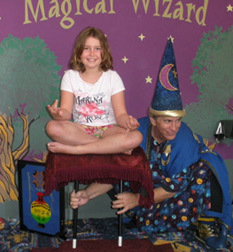 The character of the “Magical Wizard” is a bumbling, absent minded wizard, whose magic, often the wrong things happen, in a comical way, and then it is the magically empowered kids who make everything turn out okay. I do teach magic. I use to give private lessons, but have not done so in many years. I do however teach workshops for kids between the ages of 6 & 12. I offer the workshops for school age childcare centers, birthday parties and just about any other places children gather. In the workshops, the participants get all kinds of cool stuff. A magic wand (the same wand that is sold at party stores for $2), a booklet on how to do additional magic with things found around the house, and I teach them at least 6 other tricks and provide all the materials they will need to do the tricks. 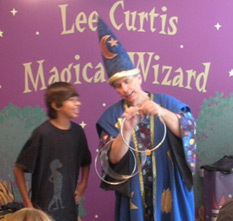 A few of the tricks I teach them include some commercially manufactures apparatus, that the kids think are really cool. Parties, I do NOT accept checks! For Childcare Centers, Schools, and Company Parties: I accept cash or Visa, M/C (credit or debit), Discover or Amex or Company Checks. No. However if you are going to pay via Paypal, I require that we process that at least 72 hours in advance. Call me to make those payment arrangements 1-800-436-8749. Otherwise all payments are required at the show. No. However if you require one, I will happily do it, and have them ready. From my experience, almost always Schools and Companies want or require them. Birthdays and child care centers don’t need or require them. The reason I don’t always do them, simply, because they are a paper tracking nightmare, (I mail you 2 copies of contract, you sign both copies and mail both copies back to me, I sign both copies and mail back to you one copy) I don’t feel that childcare centers and birthday parents have the time to get all that done, Schools and Companies have employees, that is their job, plus they usually book far enough ahead, that there is time for all this paper shuffling to get done.